(Loud) Aliaksei Zholner decided to see if he could make a working reed pipe organ entirely out of paper and cardboard, with bellows powered by the weight of a book. The resulting sounds are a little silly, but it’s a cool bit of papercraft engineering. Zupagrafika’s cut-out model book lets you build your own cold and impersonal miniature city filled with the brutalist architecture of Central and Eastern Europe. Includes seven buildings from Serbia, Moldova, Russia, the Czech Republic, Lithuania, Poland, and Russia. The linear windows of Frank Lloyd Wright’s iconic structures are the perfect subject for Marc Hagan-Guirey’s book, which comes with 14 cut-and-fold models based on buildings from the Frederick C. Robie House to Taliesin West and the Johnson Wax building. Kelli Anderson’s This Book Is a Planetarium, features six usable pop-up constructions, including a tiny planetarium, a Spirograph-like drawing machine, a secret decoder ring, and an acoustic amplifier. Each object is accompanied by an explanation of the science behind it. Filmmaker Christopher Helkey introduces us to artist Peter Dahmen, who creates complex and intricate pop-up structures from paper. We loved learning about how he got started, his build process, and watching the movement of each sculpture as it’s opened up. A unique and puzzling desk sculpture you can build from a dozen pre-cut playing cards to form a 5.5″ tall starburst. Professor George W. Hart figured out the geometry to make it work. Learn more about his mathemagical card sculptures here. Artist Ayumi Shibata painstakingly cuts intricate, layers of buildings, trees, rocks, and other structures, then layers them together inside of glassware to form incredible miniature cityscapes. Be sure to check out the Shibata’s amazing papercut tower too. Papercraft artist Taras Lesko of VisualSpicer shows off an intricate piece of wall art which can be cut from a single sheet of paper, assuming you’ve got the X-acto skills. Think you’re up to the challenge? Buy the PDF template here. To promote their new of Game of Thrones signature notebooks, Moleskine commissioned Dadomani to recreate the HBO series’ opening credits using intricate papercraft models. The end result is decidedly shorter than the full credits, but no less impressive. Making of here. Wonderfully illustrated paper models of classic warplanes that not only look cool, they actually glide. The bi-planes are great, but we’re suckers for the bent-winged Chance Vought F4U-4 Corsair. To be honest, after all the work it takes to build one, we’d be afraid to toss ours. Last year, architect Charles Young set a goal to make one small papercraft building a day for a year. He ended up doing just that, creating Paperholm, a city made of whimsical buildings and objects. You can buy some of the models here. Uhu02 makes detailed papercraft models of ships and characters from science fiction. Many of them have prints and pieces for inner layers. His Apollo 13 Lunar Module is mind-blowing. The best part? He gives away his templates on his site. Build your own polygonal menagerie with these colorful pre-cut, pre-creased paper animal sculptures. Available individually or as a bundle. 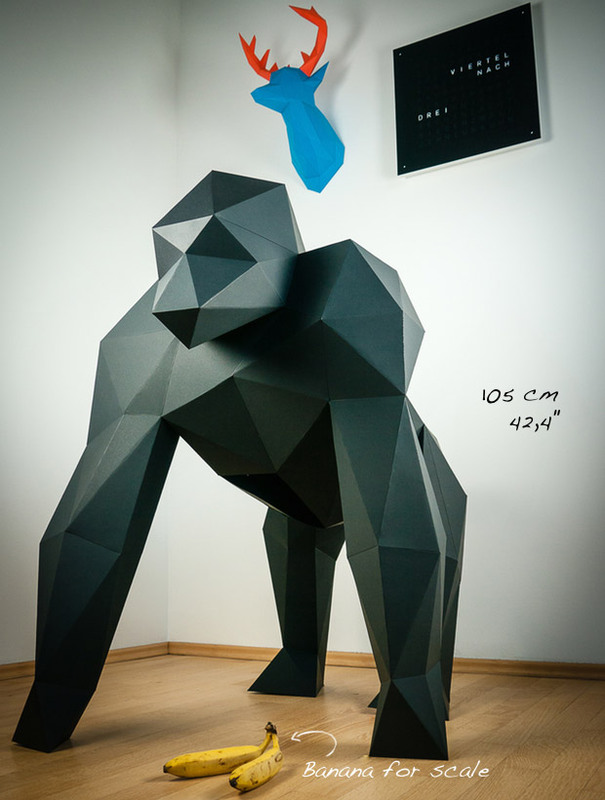 Sadly, the awesome XXL gorilla has an equally XXL price of $199. This amazing window display for Hermès was created by Thibault Zimmermann and Lucie Thomas aka Zim&Zou, who we’ve featured previously. While many of the objects are papercraft, the fox was made from leather. The perfect weapon for cardboard warfare, this papercraft kit provides die-cut templates for your very own Heckler & Koch MP7A1 submachine gun, complete with removable clip. Guaranteed not to fire actual bullets. Paul Bischof builds insanely detailed papercraft models of race cars. Ultimately, his knowledge of car design and attention to detail has led him to a career designing actual Formula 1 parts for the Infiniti Red Bull Racing team. Artists Hari & Deepti create intricate illustrations by cutting and layering sheets of paper, then adding LED light. In plain white light, they’re ethereal, when illuminated, they’re magical. Watch them make a huge version here here.